Celebrate the day with a colorful flower bouquet. This magnificent arrangement boasts a glorious combination of 12 red carnations. Spread the ultimate expression of love and affection. Note: The flowers may slightly differ based on the availability. Celebrate the day with a colorful flower bouquet. This magnificent arrangement boasts a glorious combination of 15 red carnations. Spread the ultimate expression of love and affection. Note: The flowers may slightly differ based on the availability. Celebrate the day with a colorful flower bouquet. 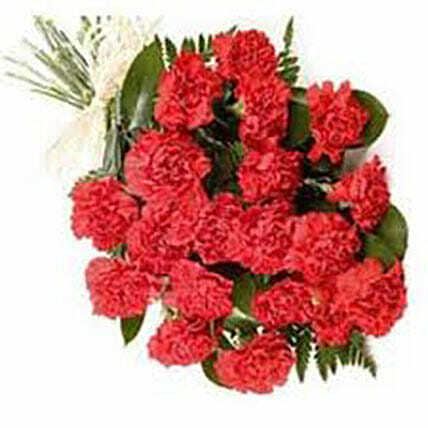 This magnificent arrangement boasts a glorious combination of 20 red carnations. Spread the ultimate expression of love and affection. Note: The flowers may slightly differ based on the availability. Celebrate the day with a colorful flower bouquet. This magnificent arrangement boasts a glorious combination of 20 red carnations. Spread the ultimate expression of love and affection. Note: The flowers may slightly differ based on the availability.